The first reason to consider this waffle maker is because it can make four waffles at once- sometimes you need a lot of waffles right?! Well the Oster waffle maker will make four for you in one shot! The next feature is the compact size of the waffle machine. At only 13×10 inches across and 4.5 inches deep, this little machine is perfect to store in a small kitchen. The DuraCeramic plates are an Oster specialty and something that many people like to seek out. The waffle maker plates are non stick and infused with olive oil rather than chemicals like PFOA and PTFE. The ceramic plates also claim to cook the waffles 29% faster (hey, the faster I get my waffles the better) and also will never flake like some of those non stick coatings tend to do. That all sounds fabulous! While there is no drip tray or way to adjust temperature on the plates, for about $30, this waffle maker seems like a pretty good deal. Time to open the box and give it a try! Right out of the box, the waffle maker looks nice and sturdy but definitely lives up to its claim to being compact- I will have no problem storing this in my tiny kitchen. While the four waffle plates look like Belgian style waffles with their checkerboard grid, they are actually fairly thin and not as deep as regular Belgian Waffles. The waffle maker had a note from Oster stuck inside the plates that said overtime, the white ceramic plates may change color but that this is normal- good to know. I plugged the waffle maker in, the power light came on and the machine was getting hot! It took about 2 cups of batter to fill the grid (1/2 cup for each square) and after 3 minutes, the waffles were still a little pale. 4 minutes, still pale. 5 minutes, still pale. After five and a half minutes, I decided to take the waffle out. They did come off the non stick, olive oil coated plates very cleanly (no batter left behind!) and to m surprise, the bottom of the waffles were super crispy. I guess the bottom plates cook better than the top plates as the top of the waffles never got very brown. The waffles were crispy enough and cooked through after five and a half minutes. The waffle maker required no clean up and cooled down about 15 minutes after I unplugged it. No temperature controls, drip tray or indicator light to say when the waffles are done. I love the fact that this waffle maker is free of PFOA and PTFE (if you haven’t yet looked up what those are, you should! Check it out here!) and that it has olive oil infused into the plates (that just sounds cool…). It did make 4 waffles in a short amount of time and the waffle maker itself is easy to store and clean. If making a lot of waffles in an eco friendly, healthy way is your goal, then this machine is for you. But if you want thicker Belgian waffles that are cooked a little more evenly, check out the Hamilton Beach 4 Piece Belgian Waffle Maker which is also compact and makes 4 waffles. 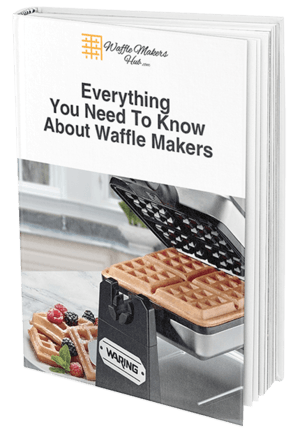 Our ultimate buying guide to the best waffle makers is also available to help you with even more waffle maker research!